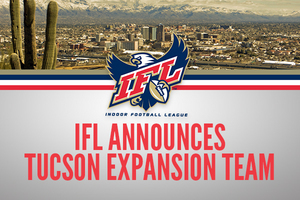 TUCSON, AZ- Tucson Indoor Football today announced the launch of a new expansion team in the Indoor Football League (IFL), that will play at the Tucson Convention Center (TCC) Arena starting in the 2019 IFL season. The Indoor Football League was founded in 2008, and has just concluded its 10th season in 2018. Tucson Convention Center Arena in downtown Tucson has been host to a variety of shows and events. TCC is operated by SMG. SMG is the “gold standard” in public facility management and they have the programs, systems and talent in place to ensure that all SMG-managed facilities run smoothly and every event they host feels like a celebration.